Most people have heard about staging a home to help it sell. 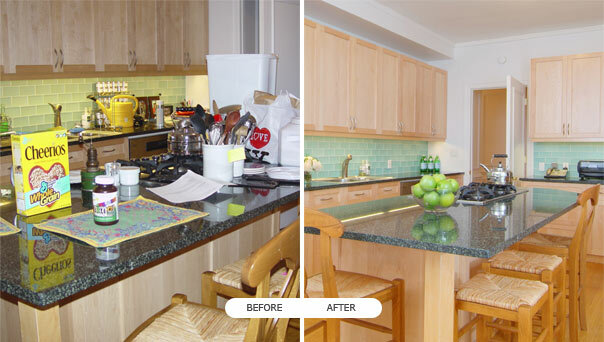 However few people believe THEIR HOME needs to be staged. The reality is, we love our homes, and they reflect our personalities and our hobbies and even our quirks. But when you are trying to sell your home, removing some of the things that are unique and personal to you can help a buyer picture themselves in the home. That can help the home sell faster. Stage a kitchen so that it shows off countertop space. Try to have no more than three appliances on the countertop (less if it is a small kitchen). If the kitchen has a center island, make it a focal point by positioning a bowl of fresh fruit or greenery on it. If there’s not an island but there’s room for one, bring in a portable one for the showing. If you can’t tell, islands are in demand. Also, add color splashes with kitchen canisters or dishes. Another in-demand feature for many buyers. Highlighting this feature can help a home sell. Make the fireplace the focal point of the room by arranging your furniture to highlight it. You can also consider painting the wall surrounding the fireplace to create an accent wall. Just be sure to stick to earthy, creamy tones or a color two or three shades darker than the other walls to make it appealing to most people. Accessorize with a single piece of colorful artwork or a mirror over the mantel. Use other accessories sparingly. Update if necessary by removing or painting dated brass screens. Don’t cover up unique features of the home. If it has floor to ceiling build-ins, highlight those through the positioning of furniture and accessories. But be sure not to clutter the shelves. If you have an outdoor living space, stage the room with furniture to show how it can best be used. If you are a huge hunter and have mounts everywhere, consider removing them and patching/repainting the walls. If you are a big sports fan and have posters all over a wall, go ahead and remove them. If you are a collector of something, pack those collections now. De-personalizing a home before showing it allows buyers to see a home’s potential for them and not focus on what you did in the space. Make sure the home is super clean. Don’t photograph or show a home that is dirty. It is an instant turn off. Clear the clutter. You are going to be moving anyway so take the time now to go through and remove or at least pack away unnecessary items from countertops, bathtubs, shower stalls and bookshelves. Also, remove or sell extra furniture that might make a space look smaller. Add nice touches. Coordinate towels in the bathroom. Keep accessories restricted to groups of one, three or five items. Set the stage for a sell. Make sure all lights and lamps are on to set an inviting mood. Close all closet doors, cabinet doors, etc. Make sure holes are patched and wall paint has been touched up. Staging takes a little bit of effort at the beginning of the home selling process, but it can help your house sell quicker. If you have questions about staging or even how to prepare to sell your home, contact me.